Citizen journalists in a small Brazilian city ignored by the country's mainstream media have shed light on the failure of its local government, marred by a legacy of administrative wrongdoing and poor accountability, to complete public works projects on time. Project Amigos de Januária [Friends of Januária], a 2011 Rising Voices grantee [en], has worked to keep the government of Januária [en], a city of 65,000 residents in the northern Brazilian state of Minas Gerais, honest since 2004. With a newly elected mayor and other local representatives assuming their roles on January 1, 2013, the citizen journalism outfit has recently reported on several city projects, including the construction of a sports complex, pavement repairs, and renovations to river docks, that the previous administration has left unfinished. 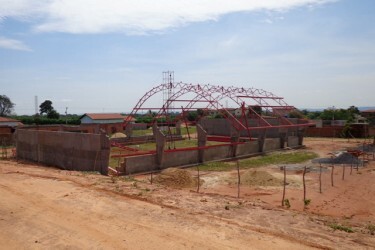 Construction of a sports complex in Januária. Photo by Amigos de Januária, under Creative Commons license. A obra possui apoio do Governo Federal e esta estimada em R$ 437.022,25. Acontece que na placa o prazo de execução é de 180 dias, mas não existe data de início da obra, o que dificulta o acompanhamento por parte da população em verificar se existe atraso na execução. The works are financed by the Federal Government and it is estimated at 437.022,25 reais [about 221.390 US dollars]. What happens is that the license states an original deadline of 180 days, but there is no starting date, which makes it difficult for the population to monitor the works and check if there's a delay in execution. Members of the project promise to keep track of the sports complex construction, in order to push “the new political administration to resume it in 2013″. 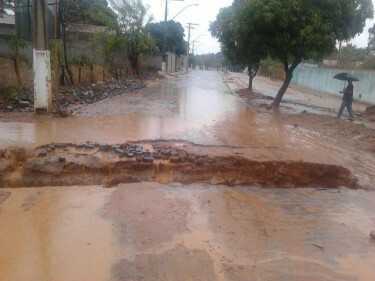 Works left unfinished in the crossing of Leão XIII street with Brasil Avenue during a summer rain. Photo by reader Wellington Silva, published by Amigos de Januária. 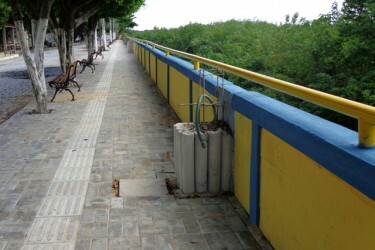 The city's docks and several works of street pavement passed their deadlines and were left unfinished by the former political administration. The organization's post shares concern over the misuse of public taxes and reports about risks faced by the population, especially during the rainy season. To celebrate 152 years since the founding of Januária, the local government began works to reform the city's docks on December 13, 2011, with an estimated date of conclusion set for May 8, 2012. However, the docks were not ready on time. As the city lies on the São Francisco river [en], the docks are its most important touristic attraction. O ponto turístico da cidade rebebeu [sic] barras de segurança a sua volta, bancos de madeira no estilo clássico e calçamento plano adequado a deficientes visuais. Entretanto apenas uma parte do projeto esta pronto, a grande maioria da passarela não está calçada e os postes de iluminação mencionados na publicidade não foram feitos nem instalados. The town's touristic attraction now boasts guardrails all along, classic wooden benches and flat pavement appropriate for the blind. However, only a section of the project was completed, and a great majority of the promenade has no pavement and the streetlights mentioned in ads haven't yet been installed or even manufactured. Docks of Januária. Photo by Amigos de Januária, used under CC license. The Getúlio Vargas Square was one of the few completed works. 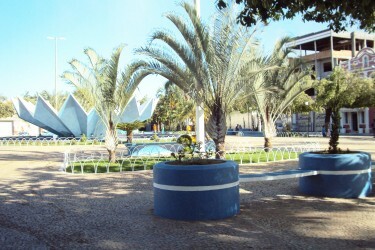 Works at Getúlio Vargas Square were completed in the town of Januária, Minas Gerais state, Brazil. Photo by Amigos de Januária, under Creative Commons license. All around the city, unfinished public works are a reminder of what the new political administration has inherited from the the city's previous leadership. Beyond stagnant constructions projects, the new administration must solve a budgetary mess leftover from before the transfer of power – civil servants’ pay for December has been delayed, and no estimate was given for January. Amigos de Januária reported that salaries had not yet been paid in early February. Januária isn't, however, an isolated case in Brazil. The lack of payment to public officials and the unfinished state of public works are features of a fragile political commitment to the city. Issues of physical and services-based infrastructure often rise in political transition periods, affecting the population. Members of the Amigos de Januária project are addressing these issues in order to keep their city running. novo para as ruas para protestar como o Lula e a Dilma, porque sempre está piorando.